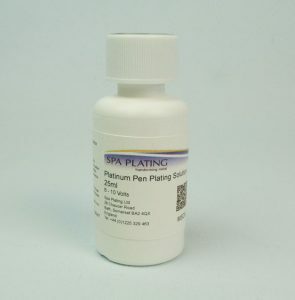 This Platinum Pen Plating Solution contains 25 grams of platinum per litre and has been designed specifically for pen plating. It plates a hard-wearing, bright layer of platinum. Ideal for both decorative and functional purposes. 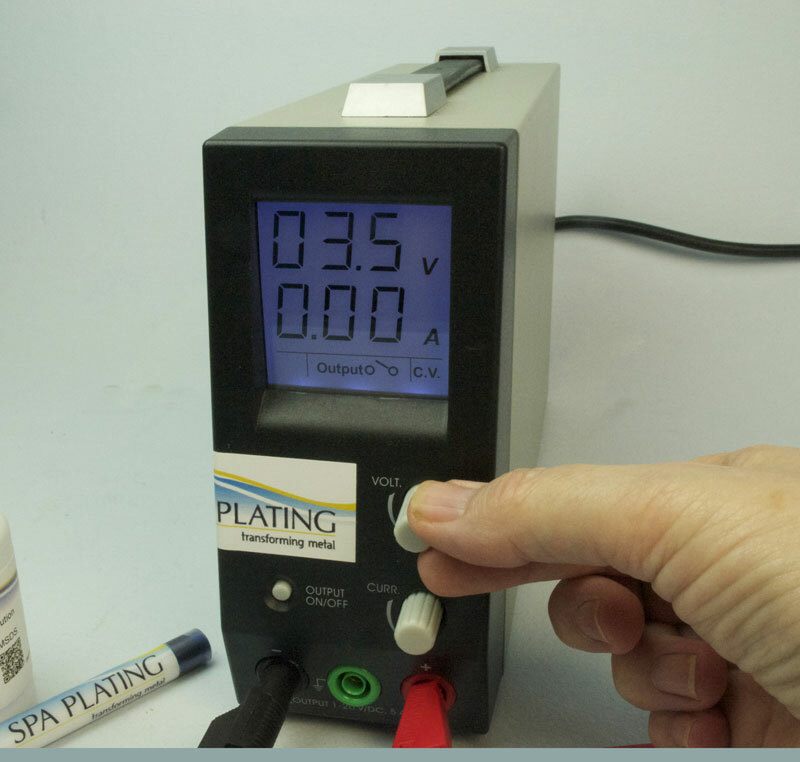 When plating on to copper or brass, pre-plate with a thick layer of gold, silver or nickel. 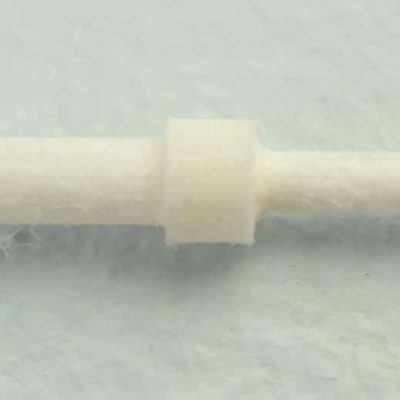 You will need to use our fibre nibs with this solution. 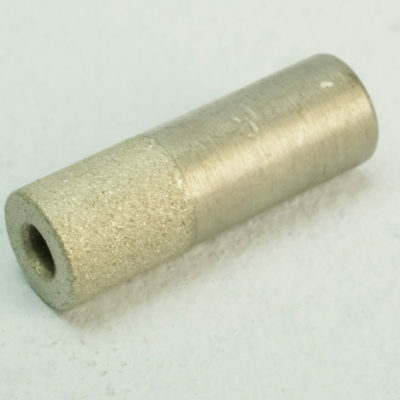 Standard nibs are not suitable for plating platinum. 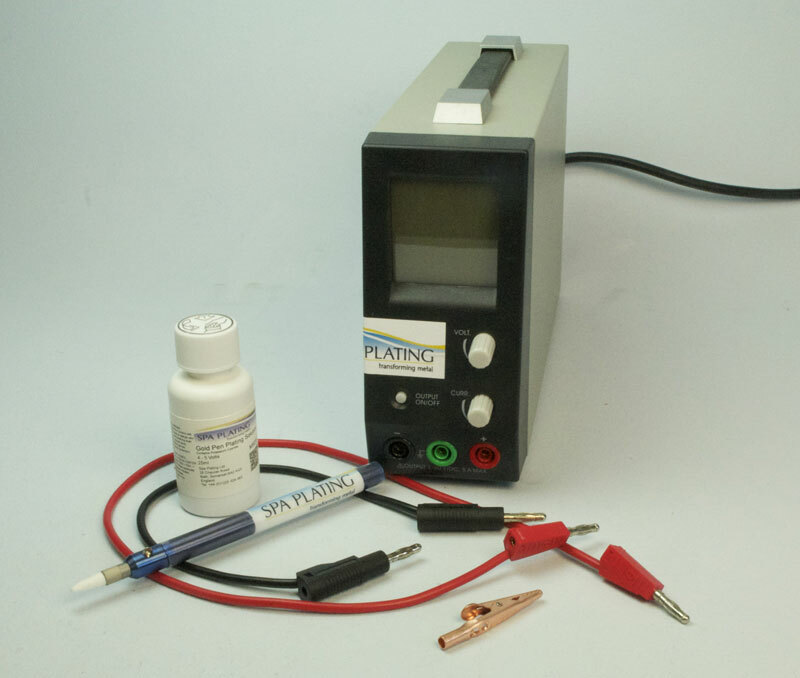 This plating solution can be used with our Battery Powered Plating Pen or our Plating pen with our MF Rectifier, links to which can be found below in the ‘Related Products’ section. 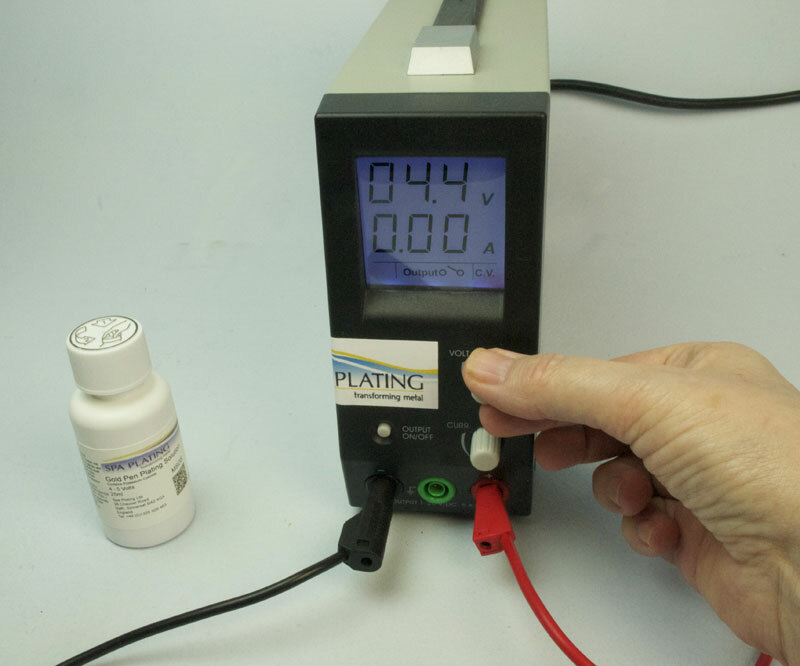 This plating solution cannot be purchased and shipped outside the UK and the EU because it’s part of our range of plating solutions which are regulated for transport. 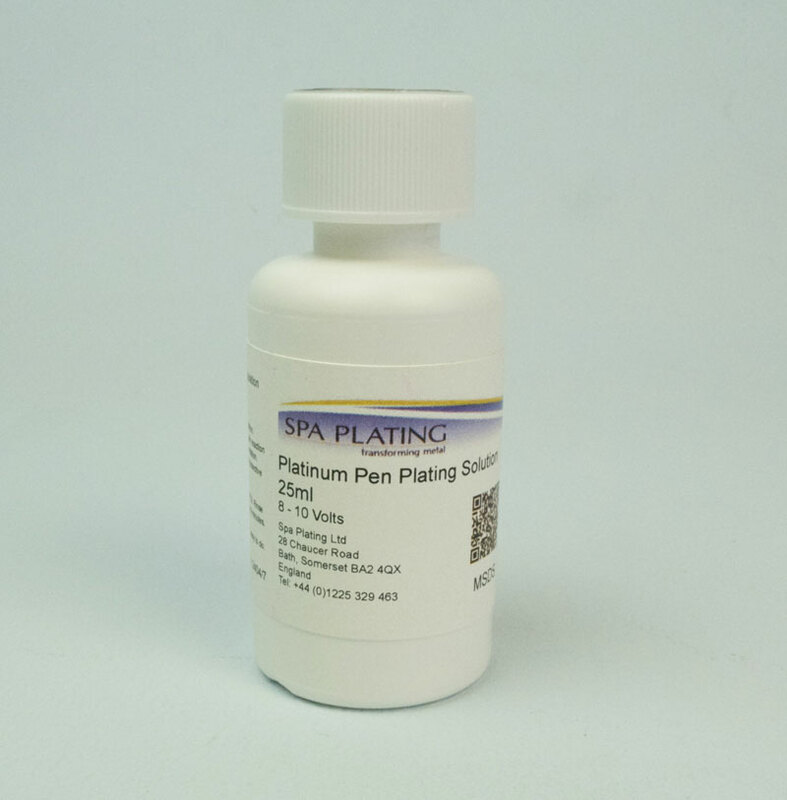 You could substitute this with our Palladium Pen Plating Solution, details of which can be found by clicking HERE. 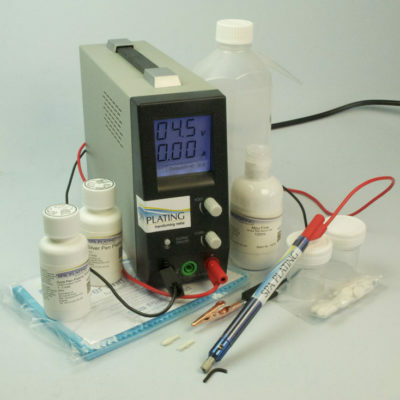 This rectifier can be used for tank, brush and pen plating. Here is a quick guide to setting it up for pen plating. 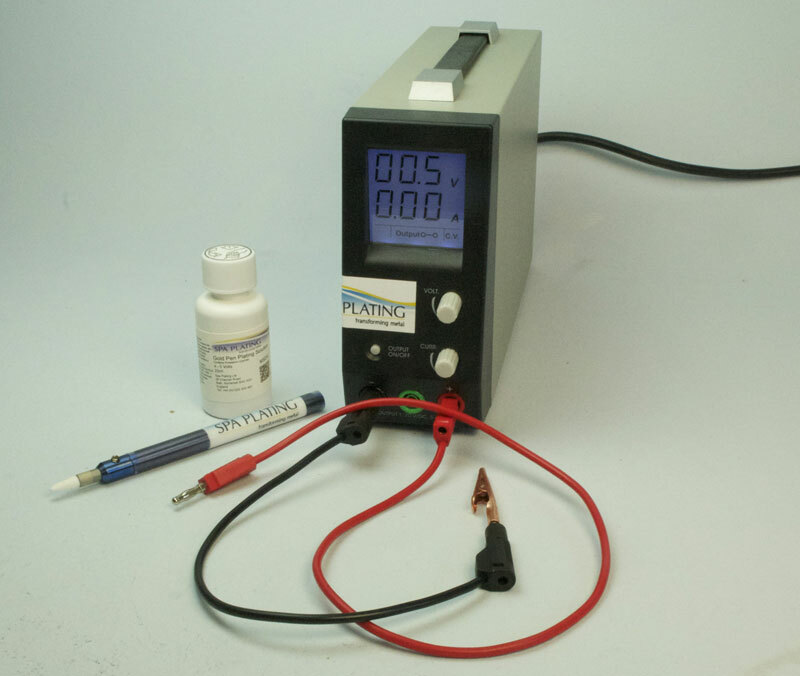 Setting up your MF Rectifier for pen plating is a straightforward process. Assemble your equipment as shown in the photo. 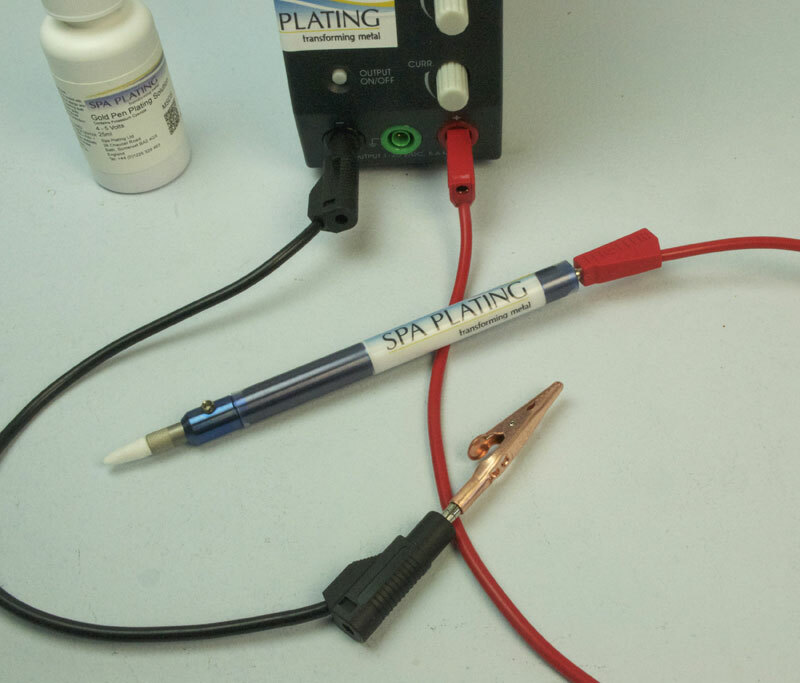 For this demonstration, we’ll be using our plating pen. 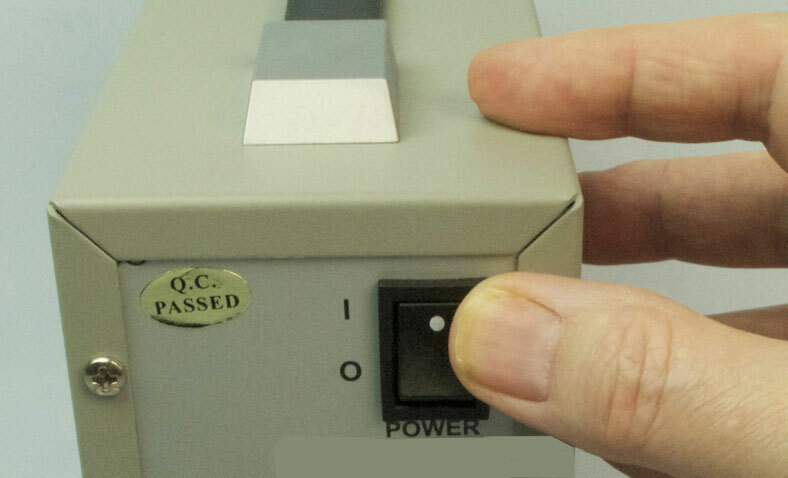 Use the switch on the back of the rectifier to turn it on. 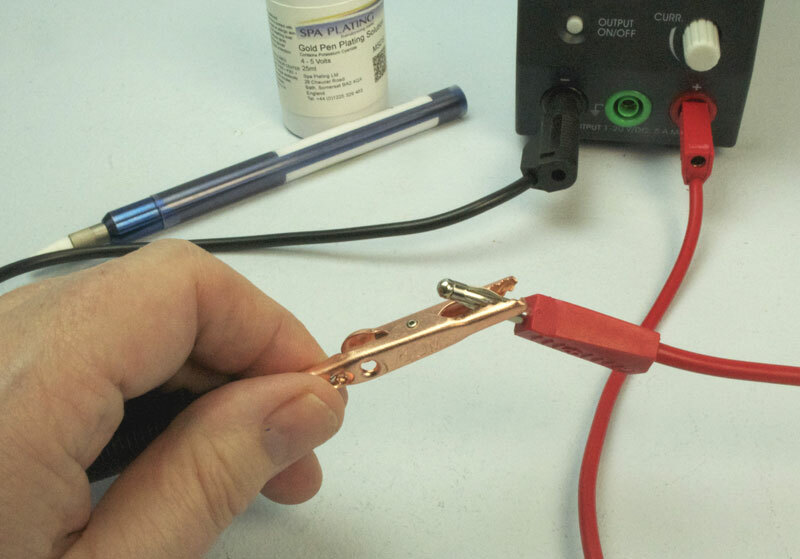 Fit the copper crocodile clip to the end of the black lead and plug the other end into the corresponding black socket on the front of the rectifier. Plug in the red lead into the corresponding red socket. 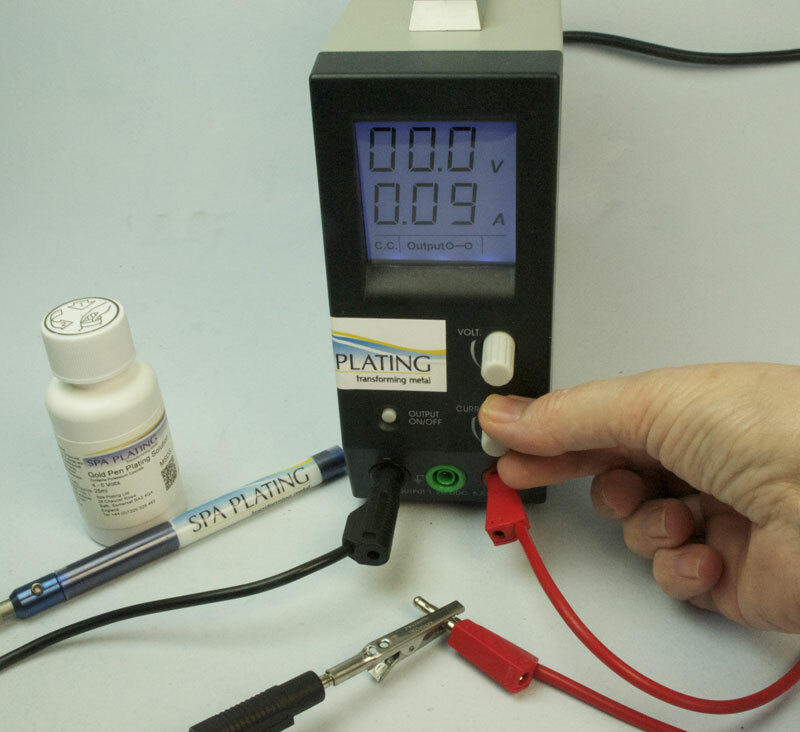 Turn the amps dial anticlockwise to the stop (minimum) and the volts to the value required by the pen plating solution. Note: Even though the amps dial is set to maximum, the amps meter will read ‘0.00’. Open the circuit (or turn the circuit off) by switching the Output switch so that the line is in the up position. Using the crocodile clip on the end of the black lead, connect the black lead to the red lead. Adjust the amps to about 0.4 to 0.5 amps. Unclip the crocodile clip from the end of the red lead. 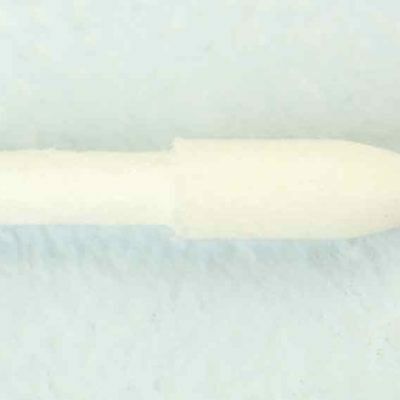 Connect the plating pen to the end of the red lead. 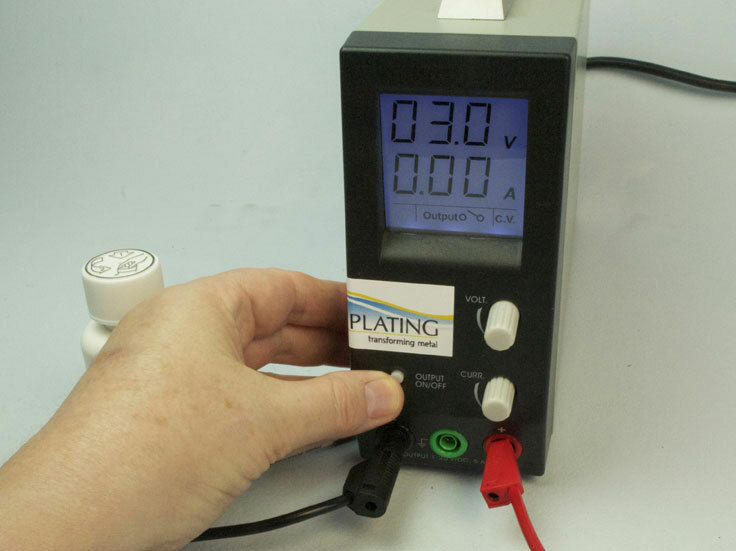 Select the correct voltage range for your plating solution. 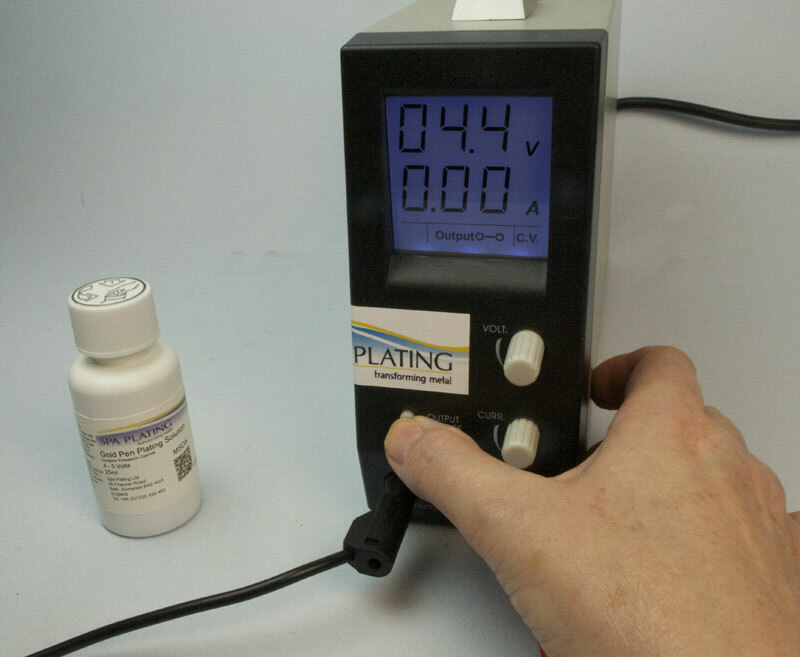 In this case the solution is our Gold Pen Plating Solution and the range is 4-5 volts. 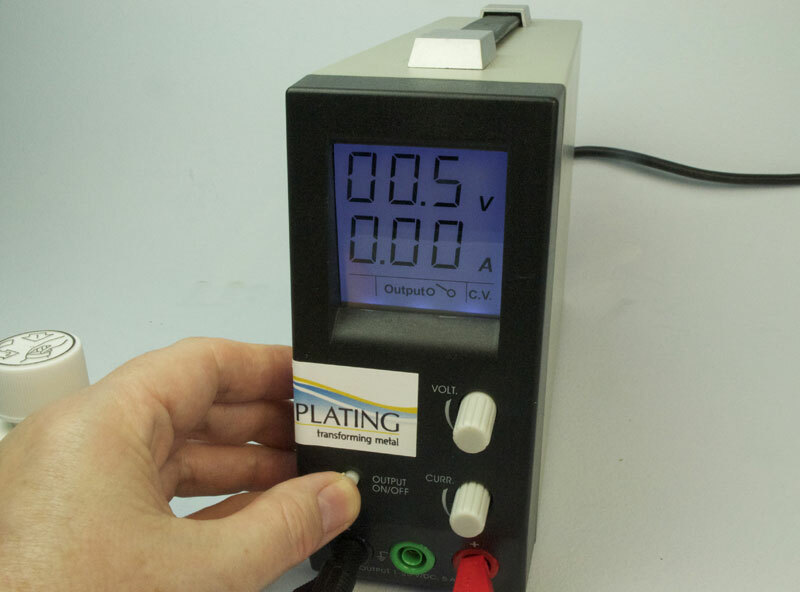 Now close the circuit and you’re ready to start plating. warm surface. You could also use an infrared lamp as a form of heating. 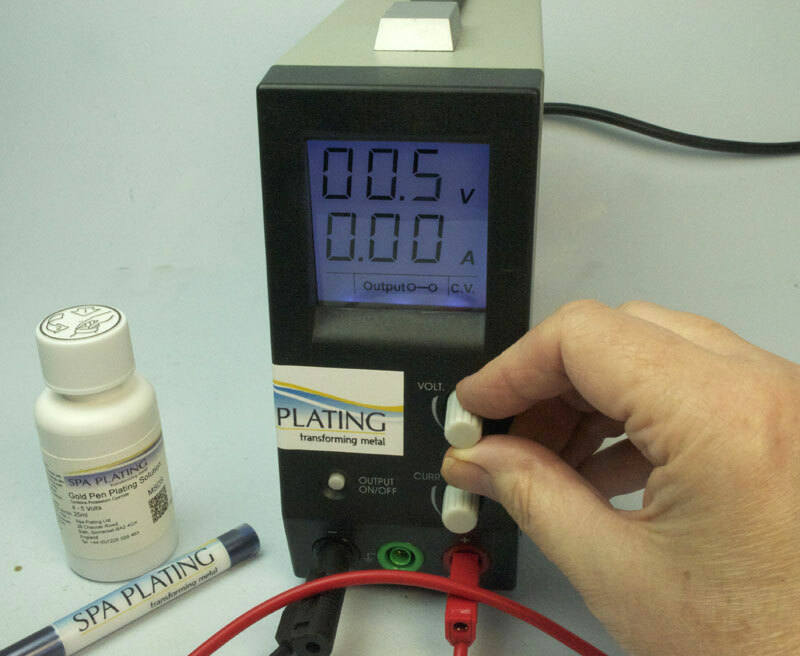 Higher voltages give greater plating rates, however more spray is produced and a mist mask is recommended. 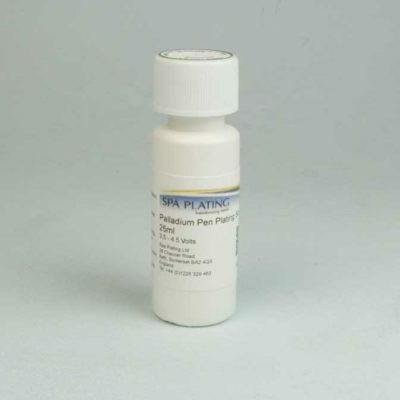 Plating rates are calculated over a sample area which is permanently covered by swab. 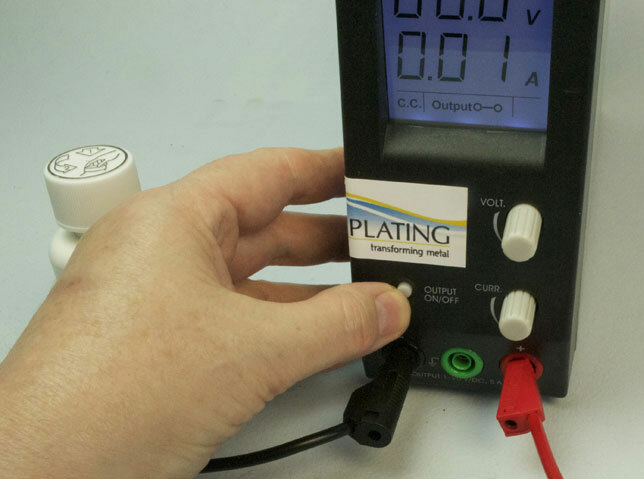 Will plate directly onto freshly prepared nickel or stainless steel. Some items are regulated for transport and can only be delivered to destinations in the UK and countries within the EU. Alternative or substitute products are detailed in the ‘Description’ tab of this tabbed panel or under Related Items below this tabbed panel.